Whilst we live in an increasingly connected world using Portals, Email and Social Media to connect with our customers, sometimes nothing betters a well printed and formatted Letter or Report – particularly for communicating Client Updates or Contractual Information. 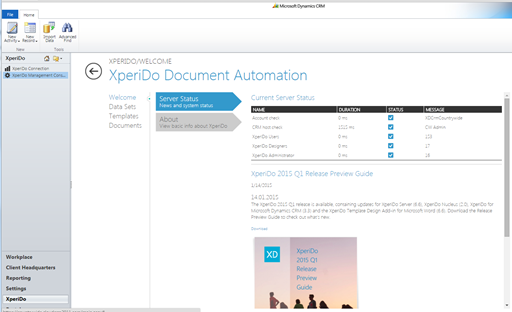 As a solution to this problem Xperido for Dynamics CRM adds deep document generation to CRM, allowing records and datasets in CRM to be flipped into newly generated Documents and Reports in a variety of File Formats including Word, PDF and HTML. This generation is handled server-side which prevents some of the problems we have seen with client-side generation where different versions of Office and Security can pose problems. This functionality then integrates into the Workflow Engine behind Dynamics CRM to allow new Documents to be produced and saved into CRM (or SharePoint) in response to system events or triggers, which can be a stronger more document centric solution for compliance. This can be perfect for managing new Instruction Letters and Contracts to Agents and Suppliers, alongside to bulk Client Update Reports to Property Managers. Support Administrators to build new Templates in Word and add these to CRM. To produce the Document or Report based on data from any of the associated relationships in CRM, either from 1:N records or N:1 records. Create documents in a few mouse clicks in Microsoft Dynamics CRM. Save your documents as any common file format (docx, doc, odt, rtf, pdf, xps, html, epub ...). Store the generated documents in Microsoft SharePoint. Print to a network printer, or send them to your CRM contacts as e-mail attachments, or even e-mail bodies. Start the document creation process from the ribbon/command bar or from CRM workflows. Server-side Document Creation – Xperido processes document requests asynchronously, which is ideal for batch document generation. Power of Choice – in the same fashion as Dynamics CRM, the Xperido Server can reside On-Premise, in a Private Cloud or in the Public Cloud. In the latter case, Xperido is delivered as a service.